We went for an autumn walk in the Olympics. 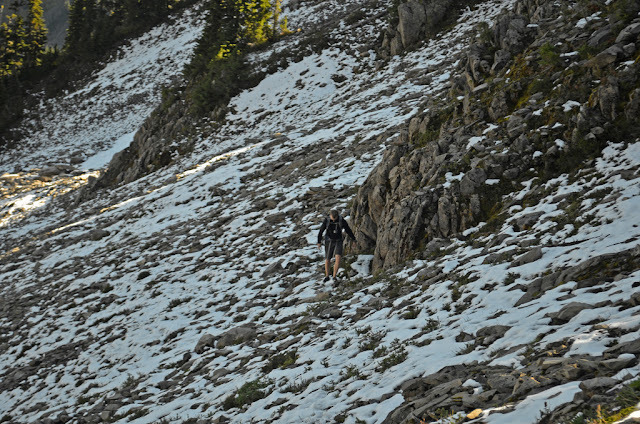 Our route would lead us up the Appleton Pass trail from the Sol Duc valley. Then go cross-country for a few hours, to achieve vista views of the surrounding mountains. This would be a challenging route, which would require a full day of walking both directions. The alpine elevations had a dusting of fresh snow from recent storms. After a pre-sunrise drive to the Sol Duc Trailhead. We started walking by 730 am. It was a dark, wet and cold autumn morning in the river valley. It was not until we started ascending the switchbacks to Appleton Pass before things started to warm up in my body and get that damp chill our of my bones. The autumn colors ascending the the pass were spectacular. After a few miles of climbing, you can start to get a view of the surrounding area. The alpine blueberry bushes were covered in fall color, but had already died for the season. Mount Olympus could be seen over the divide, that separates the Sol Duc from the Hoh. Up and up we went, on one of the most enjoyable trails I've been on in the Park. Lots of pine needles, roots and a few rocks under my feet; perfect for minimalist hiking. Color did not disappoint us the greater we gained in elevation. Once we left the trail, the traverse was a slow and great amount of focus; since the landscape is so steep in this area. The ground was saturated from the melting snow and in the shade was a dusting of snow. This made for dangerous off trail travel, because everything was so slippery. 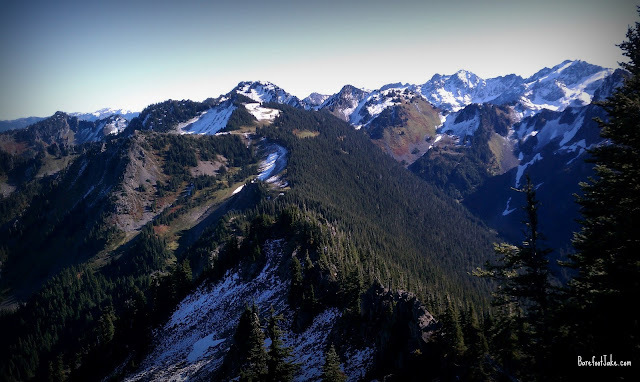 We reached a part of the ridgeline were the views were stunning of Mount Appleton, Boulder Creek, Hurricane Hill, Mount Angeles, Spread Eagle Pass, Glaciers of Mount Carrie, Heart Basin, Mount Olympus, Seven Lakes Basin and peaks of the Bailey Range. The trip back to the trailhead was fast paced. The Sol Duc valley quickly got cold and dark; as the sun ducked behind the ridgelines that form the valley. 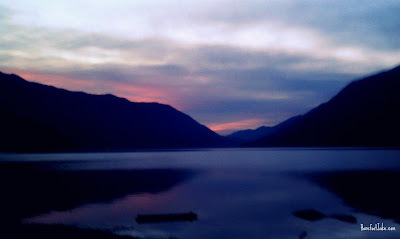 We made it out in time to catch the sunset at Lake Crescent Lodge, were I enjoyed a 'Crescent Burger' and an adult beverage. Overall it was a great time. My hiking gear worked out great for this fast and light type of trip. I will continue to remember this area, for beautiful autumn views.